Overview - Tired of the view from his one-bedroom apartment, Bud Fox (Charlie Sheen) dreams of the luxury and power at the pinnacle of Wall Street investment banking. Charming his way into the tutelage of Gordon Gekko (Douglas in an Academy Award-Winning performance), the best of the best, Fox is soon rubbing shoulders with "friends" in the highest places. But in a world that values high-risk greed over low-yield ethics, Fox will soon find himself in a most precarious position... one that will pit him against his mentor in a winner-takes-all contest that neither can afford to lose! Corruption, greed, excess, and big hair - it must be the '80s, and no film captures the "Me" era better than Oliver Stone's 'Wall Street.' Part morality tale, part old-fashioned thriller, and lorded over by Michael Douglas in a mustache-twirling performance as the ultimate '80s bad guy, 'Wall Street' is as near-perfect an indictment of the decade as ever put on film. Fresh off his Oscar-winning success with 'Platoon,' Stone finds familiar dramatic territory in 'Wall Street,' trading the jungles of Vietnam for the urban jungle of New York. Bud Fox (Charlie Sheen) is an ambitious young corporate raider who, like Sheen’s character in 'Platoon,' finds himself torn between two father figures. There's dear old pop (Martin Sheen), the faithful employee of a fading airline company, who believes in the tireless ethic of Old America -- work hard, tell the truth, and collect a big fat pension after forty years of labor. 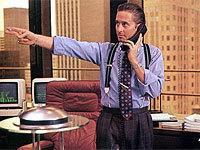 Then there’s Gordon Gekko (Michael Douglas), the spawn of Reaganomics, who doesn't create companies but sure loves to wreck them and scoop up profits from dirty deals and insider trading. As Gekko declares in the film's most famous line, “Greed is good!” but is Bud willing to sell anything, including his soul, to succeed by Gekko’s philosophy? Stone doesn't have a particularly original story to tell here, with the first half of 'Wall Street' playing out exactly as we expect. We watch (part in horror, part in envy) as Bud is seduced by the dark side, quickly ascending the ladder of excess, as Stone trots out endless (and endlessly entertaining) montages, guiding us through the canyons of “The Street” and around the stock exchange floors where the deals play out. All the while, Gekko is slowly and methodically destroying each of his young charge’s principles, and Stone delights in painting each stage of Bud’s story arc in big, bold letters to be sure that none of us miss the morality play at work. It's not subtle, but it's undeniably effective commercial cinema. Despite its heavy handed techniques, 'Wall Street' paints a heightened, but still accurate portrait of the '80s landscape, with Douglas at its heart -- he's oily perfection as Gekko, utterly nailing the smarmy sarcasm and ruthless business ethics of the era. Douglas towers over ‘Wall Street,’ his presence casting a shadow across every scene, though he’s only on screen for less than half of the film. It's an iconic, now-classic performance for which Douglas took home an Oscar. Despite the film’s drawbacks, Stone has never balanced his didactic and commercial filmmaking abilities as deftly as he does here, and after twenty years, that's still what makes 'Wall Street' so much fun. Add to that the strong performances (not only by Douglas, but the underrated turns by both Sheens), a nice eye for period detail, snappy pacing, and enough classic lines to fill ten other flicks, and 'Wall Street' remains one of Stone's most satisfying efforts. Fox recently remastered 'Wall Street' for a 20th anniversary DVD that was released last year, and this 1080p/AVC MPEG-4 encode (at 1.85:1, though mislabeled on the back packaging as 2.35:1) is minted from the same source. Unfortunately, it's not a great upgrade, and there wasn’t a single moment that made me think I was watching more than a good standard-def DVD. The source is in good shape, with a few blemishes here or there, but overall it's clean. Grain is present, but it gives an appropriate film-like veneer and it's never excessive. Colors don't appear particularly vibrant, and flesh tones veer towards the red, giving everyone a slight pig-face look. Black levels never seem particularly deep and contrast is a bit flat, though both remain consistent. Ditto for apparent detail and depth, as the image looks entirely two-dimensional and soft. Shadow delineation doesn't offer much either, with most fine details a bit murky. At least the encode is clean, and there are no major artifacts, but don't expect much from 'Wall Street,' which is certainly one of the weakest catalog efforts I've seen yet from Fox. The box says there’s a DTS-HD Lossless Master Audio 5.1 Surround track on the disc, but quite frankly, it sounds like a stereo track. This is about as bland as a 1987 film can sound. Surround use is just about nil. I can't recall a single, truly discrete effect emanating from the rears. Minor ambiance is just that -- minor. Score bleed isn't any better, with the vast majority of the mix directed to the fronts. Stereo separation is perfectly fine, and dialogue is generally directed to the center, but it all sounds like sonic mush, and none of the elements stand out in the mix. Dynamic range is passable, but flat -- don't expect much in the way of pronounced bass or rich, warm high-end. Dialogue is understandable and doesn’t have any volume balance issues, but that's about the biggest compliment I can pay to this track -- it's as bland as styrofoam. Audio Commentary - Oliver Stone flies solo on this track, and to those who regard 'Wall Street' as one of his more impersonal, commercial efforts, his commentary will surprise. In almost hushed tones, he opens up about the intimate connection he shared with his late father -- a Wall Streeter himself -- and how that relationship influenced the development of the script and framed the mythological underpinnings of the Bud Fox-Gordon Gekko dynamic. It's fascinating and illuminating, which makes it a shame when Stone starts to clam up less than halfway in. If the second half of the track is slow-going (there are frequent gaps of silence), there are still enough nuggets to make this worth a listen for fans. 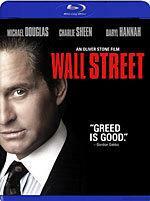 Documentary: "The Making of Wall Street" (SD, 57 minutes) - This 2000 documentary was recorded at the time of the commentary, but compliments it nicely with a then-fresh selection of interviews, including Stone, Michael Douglas, Charlie Sheen and Martin Sheen. Though the video quality is a bit dated, there is a sizable chunk of behind-the-scenes footage and of all the extras on the disc, it focuses the most on the shoot, as well as on Stone's work with the actors on the performances. 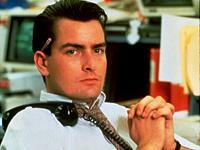 "The Making of Wall Street" is worth a watch if you're really into the film, but it's not absolutely essential. Documentary: "Greed is Good " (SD, 54 minutes) - What, another documentary? Produced for last year's 20th anniversary DVD, this brings back Stone, Douglas, and the younger Sheen for brand-new interviews, plus John C. McGinley, Hal Holbrook, and editor Claire Simpson, plus a host of real Wall Street types, who all discuss the film's continued legacy. Unfortunately, after viewing the commentary and the previous doc, it does start to feel redundant. Also, there’s a lot of padding, with clips and cast & crew "insights" into the characters and story that are obvious just from viewing the film. However, the added context of the real Wall Streeters is welcome, and a montage of the film's many quotable lines is amusing. "Greed is Good" isn't quite good enough on its own to replace the commentary and the doc, but if you're only going to watch one of the extras, I'd still probably go with this one. Deleted Scenes (SD, 24 minutes) - 'Wall Street' already clocks in at well over two hours, so almost all of these cuts were certainly wise. Expanded upon are Bud's early nightlife escapades, along with added background on his workplace interactions with some of the nicer characters. Easily the best reason to watch these scenes is for an extended version of Douglas' famous "Greed is good" speech, which is worth the price of admission on its own. Stone offers optional commentary for all the scenes, which are presented in poor-quality SD video. Theatrical Trailers (HD) - Full HD spots are provided for 'The Devil Wears Prada,' 'Kingdom of Heaven' and 'Phone Booth.' There are no trailers for 'Wall Street,' however. Some elements of 'Wall Street' are dated, but it holds up as a compelling and thematically relevant exploration of rampant greed in today's anything-for-a-buck corporate culture. It also boasts first-rate performances from Charlie and Martin Sheen, as well as Oscar-winner Michael Douglas. This Blu-ray release is a mixed bag, with video and audio that simply don’t offer much of an upgrade over the standard DVD, though the extras are certainly nice. This is worth picking up for newbies, but if you already own the previous DVD don't expect much bang for the buck.